A detail from the 2018 joint agency report on North Shore traffic, with a bunch o’ recommendations on how to reduce congestion. It seems Fraseropolis got it wrong in 2014 when we downplayed reports about traffic jams on the North Shore. I said that with almost zero population growth, an ageing demographic and improving transit, traffic volumes in North and West Vancouver should be subsiding. A photo used to promote a public forum on traffic, from the North Van Parks and Rec Commission. 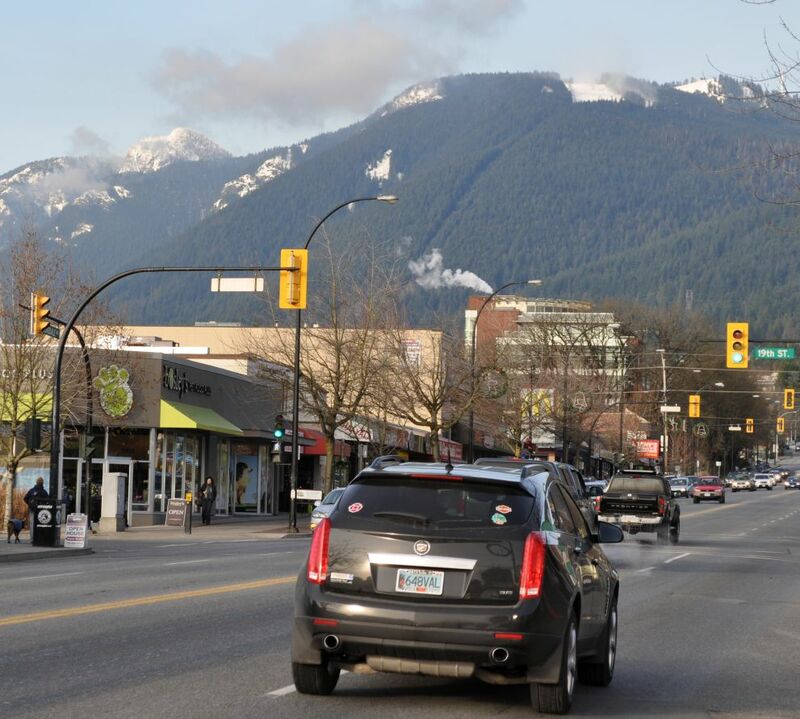 However, a new report from a multi-agency task force points out that industrial and commercial development on the North Shore is drawing thousands of workers from across the Burrard Inlet, and heavy truck traffic is increasing as well. 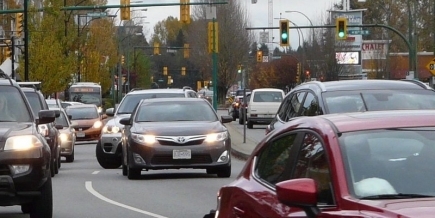 North Vancouver is now one of the region’s traffic hot spots, especially around the two major bridges in the afternoon rush. Congestion is caused by motorists. More motorists, more congestion. There is no single solution and no instant solution to congestion. We could look at mobility pricing, which would quickly discourage discretionary trips and free up road space. However, this idea was politically impossible when it was floated within the NDP government in 1995, and I think it’s impossible now. Therefore, it gets only a mumbling reference near the bottom of this document. In general, you can’t build your way out of traffic congestion. When you build or widen a road, more cars will appear. I was reminded of this in recent days as I commuted on Highway 1 from Maple Ridge to Burnaby. After multi-billion dollar upgrades to this highway from 2009 to 2013, the peak-direction speed of traffic through Coquitlam and Burnaby is slower than it was in 2008. Public transit is a useful response to congestion, at least in allowing a lucky minority access to a reliable commute. 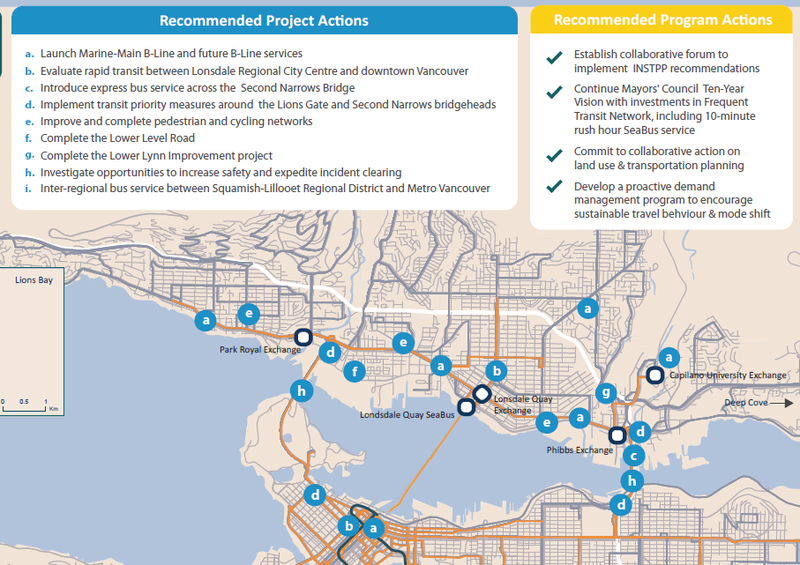 The report says improvements are on the way for the SeaBus and for east-west transit on the North Shore. If city governments are going to permit industrial and commercial expansion, they have a responsibility to enable housing construction (i.e. apartments and townhouses) nearby. The report proposes targeted construction of new road connections to relieve short-distance bottlenecks. The Lower Lynn Improvement Project, described on a provincial website, may succeed in separating local truck traffic from longer-distance commute traffic. The Lower Level Road project is hard to judge, as it’s invisible online, perhaps overshadowed by a now-completed North Shore project with an identical name. 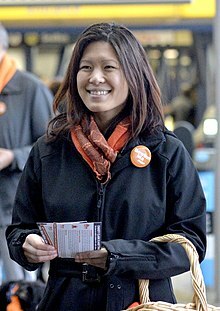 This traffic study initiative was put together by Bowinn Ma, a young and energetic New Democrat legislator from North Vancouver. Its modest conclusions are endorsed by North Shore municipal councils and First Nations as well as the regional transportation authority and the provincial government. At the very least, this should improve the chance that the proposed new roads and transit receive funding from regional and provincial budgets. Inevitably, the “no quick fix” theme ignited outrage in the North Shore community news chat threads after the report was released in early September. Many critics demanded a third vehicle crossing of the Burrard Inlet. This was suggested as long ago as the 1990s by a few property developers, and rejected by the City of Vancouver, which does not want to receive more traffic. Even a one-lane widening of the Lions Gate was shot down by the City of Vancouver. An alternative route, also floated in the 1990s (by Maple Ridge), would cross Indian Arm from North Vancouver to Port Moody and Coquitlam. This would encounter local opposition in the Tri-Cities and serve a very limited purpose.